Julieta Corpus describes her poems as attempts to encapsulate a moment, an emotion, or an event which, hopefully, will leave an indelible mark in her readers. Her poems have been published in Tendiendo Puentes, The Mesquite Review, UTPA’s Gallery Magazine, Festiva: The Writers Issue. 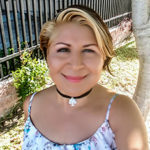 She has also been included in various poetry compilations, such as Writing to Be Heard: Voices from the Chicho, STC’s Interstice, and four Valley International Poetry Festival Boundless Anthologies, The Thing Itself, and the Texas Poetry Calendar. Julieta has participated in poetry events in the United States, Mexico, and Cuba. In January 2018, she travelled to San Miguel de Allende, Guanajuato to read her poem which appeared in the Solamente En San Miguel Vol. II anthology. Currently, she works as a bilingual translator for EM Editorial in Brownsville, Texas and also edits and translates everything from poetry collections to books of psychology as an independent contractor. Join us for six writing workshops. We will be writing using six different writing genres to expose you to different ways of activating your creative juices. No previous writing experience is required. The instructor will lead you through each writing exercise, step by step. The goal is to build a safe place during each workshop where you feel free to express yourselves without fear of judgements. No will tell you that you’re doing it wrong you are also not obligated to share your work. If this sounds like something you’d like to try, then sign up today!